Was wandering what are the mud piles I've been seeing in my lawn for the last 2 weeks...it progressed to digging in the lawn (raccoons? at first I thought it was squirles but concluded that that wouldn't be it because digging happened at night. Was wondering about moles because some of these holes were rather large. Some turf was just lifted and turned over...). This morning I examined a bunch of wholes in the lawn in an area where the grass also looked as though some animals must have been rummaging through. I was trying to figure out what's going on and whether the holes are actually tunnels... and discovered what I thought are some sort of larva digging (2 of them, each in its own "chimney") in the dirt, maybe an odd type of grub?). Did some research and thought that the June Bug descriptions made sense, but the pictures I saw were not convincing. Your site has been extremely helpful (I started at bugguide.net) in confirming that what I have collected this morning (and is now dug into dirt in a large container indoors) is actually brood XIV nymph! It gotten darker color it seems since this morning...I am very curious and almost feel honored to have seen them in my back yard and have one captured, but I am petrified at the same time after reading the numbers I am to expect...not to mention the fact that I would probably won't have a lawn left by the time the raccons have had their "periodical" dinners over with...Do you know how many days until they are to immerge on Long Island? 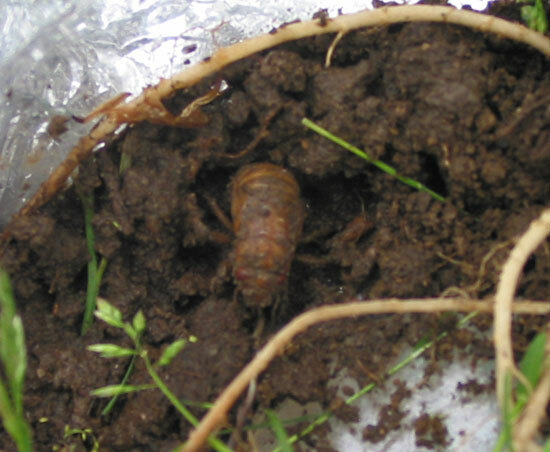 It does sound like some ground-dwelling or burrowing animal, like a mole is digging in your yard to obtain Brood XIV periodical cicada nymphs. The nymphs are currently a few inches just below the surface waiting for the soil temperature to be just right before emerging. The mud chimneys are made by one of the three species of Periodical Cicadas, Magicicada septendecim the biggest of the three make them. 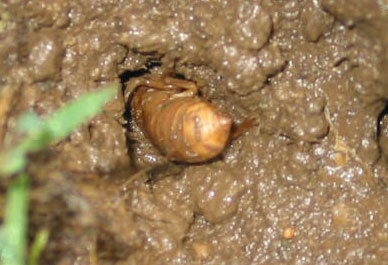 You can expect them to emerge from the ground around the middle of the third to the last week of May.